Ken Kremer for SpaceRef: Space Shuttle Discovery was hoisted and "hard mated" to her fuel tank and twin rocket boosters for the final time on Saturday (Sept. 11), before she is retired from active duty service following her last scheduled flight - the STS 133 mission to the International Space Station (ISS). After being hauled inside the Vehicle Assembly Building (VAB) on Sept. 9, an intricate day-long operation to hoist Discovery up high and vertically bolt the 100 ton orbiter to the huge external fuel tank (ET) and twin solid rocket boosters (SRB's) commenced later in the day in the VAB. Along with just a handful of other very lucky media representatives, NASA granted me extraordinary and extremely rare access to the highly restricted inner workings of shuttle launch processing activities. I was present to observe and photograph the carefully choreographed "lift and mate" operations up close from multiple angles and levels inside the VAB. I experienced jaw-dropping and once in a lifetime scenery about every other millisecond. See the majesty of the shuttle revealed in mid air in a selection of images from my photo album below. 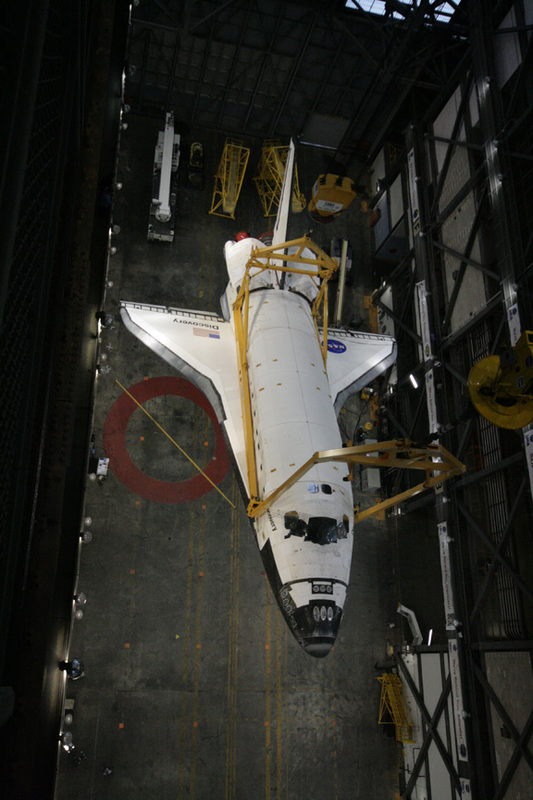 With Discovery sitting atop the 76 wheeled transporter, the lengthy process to lift and mate the orbiter to the fuel tank and boosters began late in the day on Sept. 9 following 'rollover' from the processing hanger known as Orbiter Processing Facility-3. 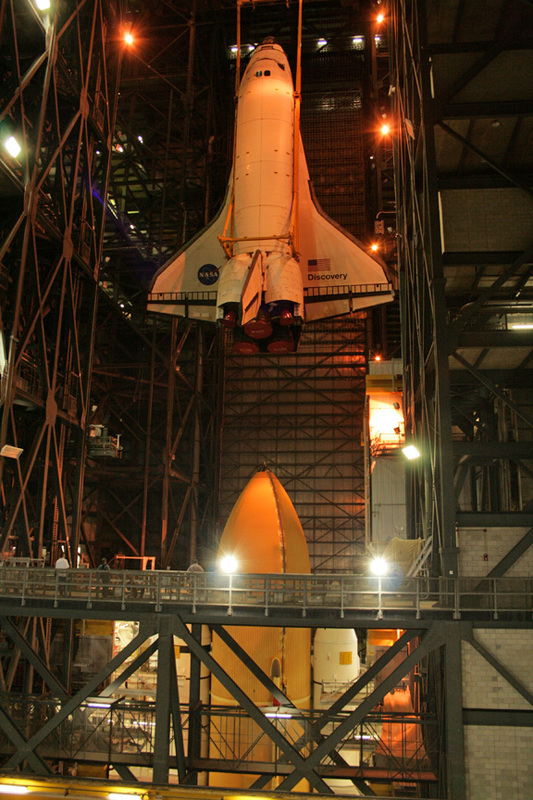 Technicians first attached a large yellow, metal sling to shuttle Discovery in order to lift if off the floor at the center of the VAB - known as transfer aisle - into High Bay 3. Discovery was then slowly and methodically hoisted on pulleys and chains into the vertical position. 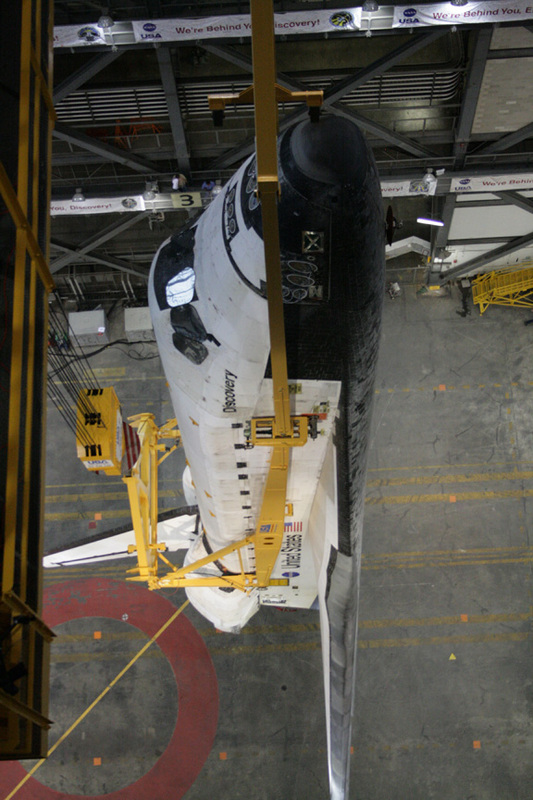 As Discovery was tilted up and the tail arced down to the hard concrete floor, workers were vigilant to carefully maintain a watch on the tail which ultimately came to rest in a position just a few feet above the floor. There she hung for many hours until all swinging motion had dampened out. NASA photographers then collected high resolution imagery to document the condition of all the delicate heat shield tiles. Many thousands of tiles will protect the orbiter from the scorching heat of re-entry into the Earth's atmosphere at the conclusion of the STS 133 mission. At a snail's pace, Discovery was then hoisted by crane operators towards the 52 story VAB roof, rotated 90 degrees and then moved up and laterally over walkways on the 16th level into High Bay 3 where the ET and SRB's had already been assembled and stacked to await the arrival of the Discovery orbiter. Our media group and NASA escorts watched this entire operation in total awe from the 16th level and some 300 ft high, as Discovery passed by us just yards away. The processing activities stretched all through the night and into the next day. Discovery was then lowered into place beside the rocket stack inside High Bay 3. But engineers ran into a problem while initially securing the orbiter to the ET. 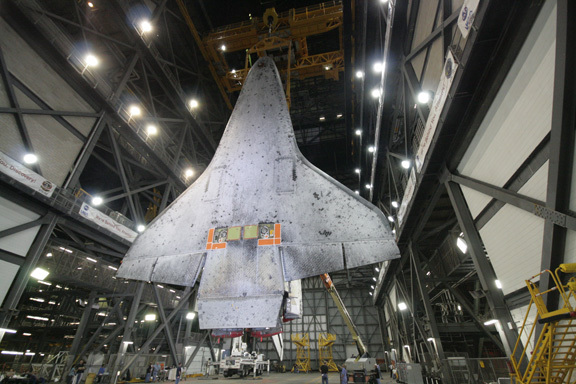 During installation of the left-hand main separation bolt on the bottom of the shuttle, the corresponding nut fell into the shuttle's aft compartment. Evaluations indicated that no damage occurred from the incident. The right-side bolt already had been attached. 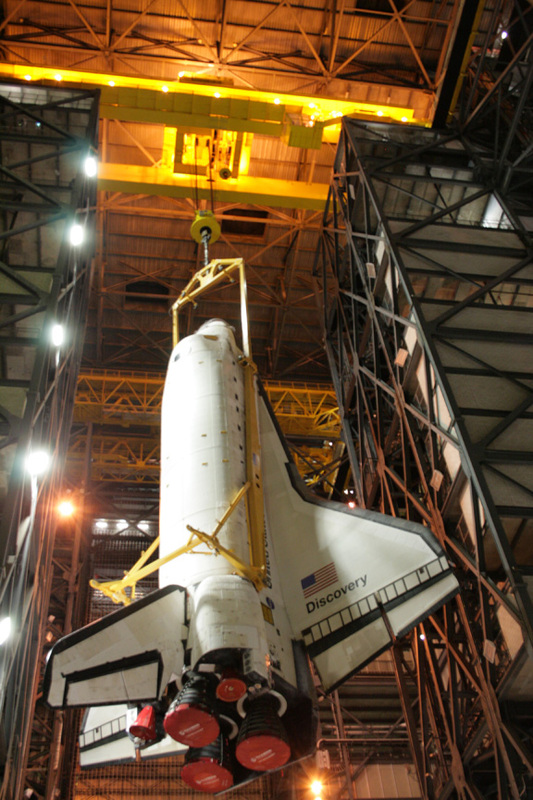 After thoroughly assessing the situation and developing a plan to fix the problem, technicians were cleared to put up several work access platforms Friday night (Sept. 10) and used them to enter Discovery's aft section through an access door. They then moved the nut back into position and finished attaching the bolt, which is used to separate Discovery from the ET once the shuttle is in orbit. Altogether, there are three attach points which bolt the orbiter to the ET. Explosive bolts within the attach point system ensure that the ET successfully separates from the shuttle after the spacecraft reaches orbit. Discovery now is fully attached to her ET and two solid rocket boosters. The final process known as "hard mate" was complete at 9:27 AM EDT on Sept. 11. 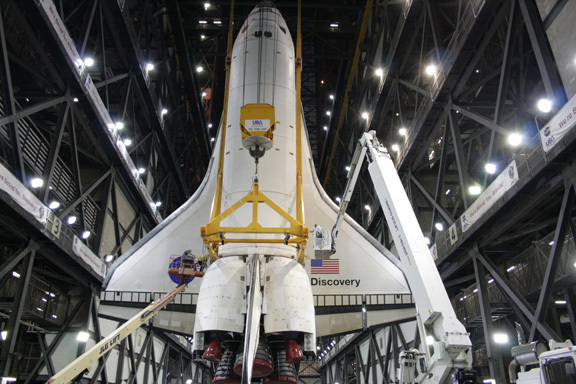 Discovery is scheduled to be rolled out to Launch Pad 39 A on Sept. 20. STS 133 is slated for a Nov. 1 launch at 4:40 PM EDT from the Kennedy Space Center with a crew of six astronauts. STS 133 is the 39th and last scheduled flight of Discovery. During the 11-day STS 133 mission, Discovery will take the Permanent Multipurpose Module (PMM) packed with supplies and critical spare parts, as well as Robonaut 2 (R2) to the station. It's a melancholy moment for the Discovery shuttle team. Everyone is excited to be processing the orbiter for launch. But at the same instant, excitement is mixed with great sadness. Because barring a miraculous extension this is the last launch for Discovery. The shuttle program is being terminated for lack of money from the Federal Government in Washington, DC - not because of safety concerns. Top shuttle managers have told me that the shuttle has never been safer to fly than now during its 30 year history of operations. In the midst of the Great Recession, about 8000 shuttle workers at KSC will be layed off and about another 10,000 to 20,000 jobs are expected to evaporate in the local economy in the communities surrounding the Kennedy Space Center. 900 layoffs are set to occur at KSC on Oct. 1. 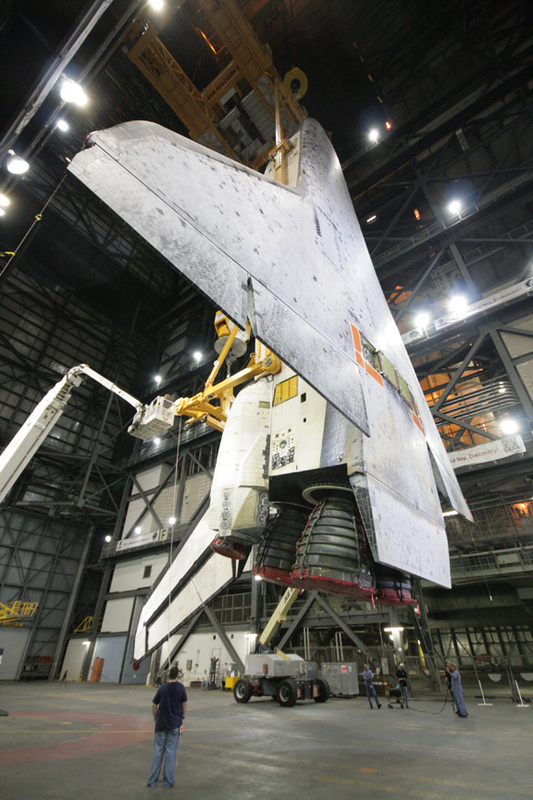 Thousands more layoffs will occur across the US at the Johnson Space Center, Michoud Assembly Facility, ATK and elsewhere as the shuttle program is prematurely shutdown at the height of its operational capabilities. Much of this technological know-how will be dispersed or lost. America's manufacturing capacity will be further dismantled. And America will have no capability to launch people into space on American rockets for many years to come. NASA will have no choice but to pay Russia more than $50 million per seat to launch American astronauts aboard Soyuz rockets to the ISS. Meanwhile China's space program, technological prowess and economy are expanding at a dramatic clip. Read my earlier STS 133 launch processing report here and here. All images credit: Ken Kremer. 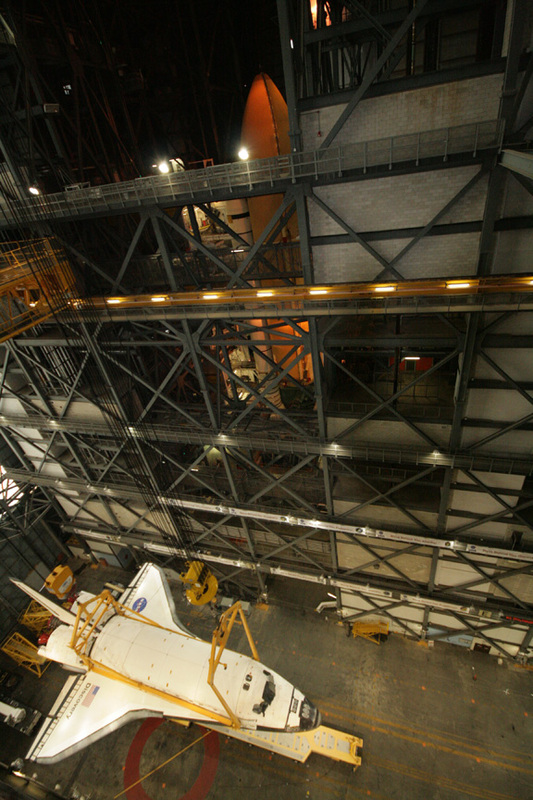 Workers in the Vehicle Assembly Building secure a large yellow, metal sling to shuttle Discovery for its lift from the VAB transfer aisle into High Bay 3 on 9 Sept 2010. 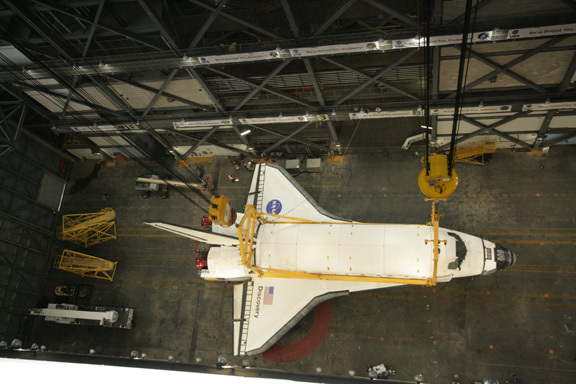 Overhead view of Discovery attached to yellow metal sling and sitting atop 76 wheeled transporter after rollover from the Orbiter Processing Facility to the VAB. View of Discovery being hoisted away from transporter. Note stacked ET (orange) and twin SRB's (white) standing inside High Bay 3 and awaiting attachment of Discovery. 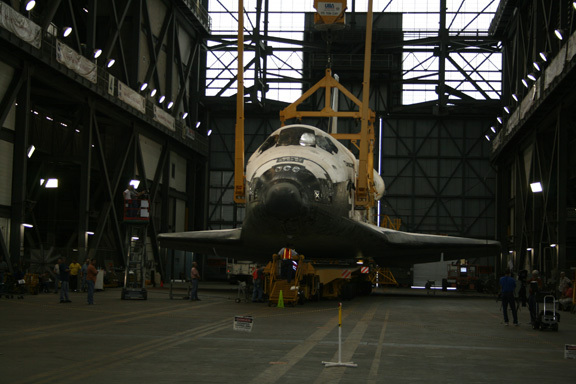 Hoisting Discovery in the transfer aisle of the VAB. Awesome shot of vertical Discovery attached to metal sling. Side view of Discovery and main engines as I stand beneath orbiter wing and heat shield tiles on belly and wing leading edge. Full belly view of Space ship Discovery coated with thousands of protective heat shield tiles. Note two rectangular attach points holding left and right side main separation bolts. Hoisting Discovery near to roof of 52 story VAB. Hoisted Discovery in mid-air is lowered into place beside the external fuel tank (ET) and two Solid Rocket Boosters inside High Bay 3. Hard Mating to ET was completed on September 11, 2010. 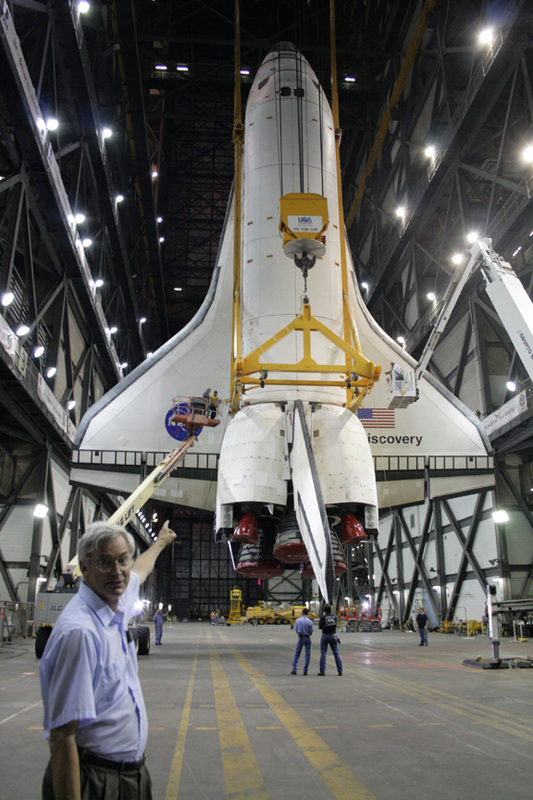 Ken Kremer and Discovery inside Vehicle Assembly Building at the Kennedy Space Center.